If you are affected by the vintage things and you love all about Cadillac, you will be really surprised by this amazing suit! 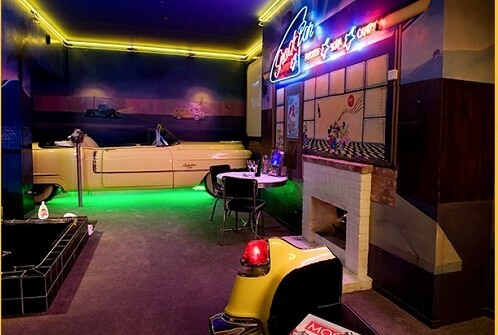 There are Cadillac-bed, fireplace, hot tub and in the bathroom you can see the car hood with a sink. Big size movie screen and projector will help you have some pleasure with your lovely films. Neon illumination will create unforgettable impressions. You can book this suite in the Victoria Mansion Hotel in Los Alamos, California. There are also 5 others: The French Suite, The Roman Suite, The Gypsy Suite and The Pirate Suite.